No matter what the reason, sending some attractive and beautifully arranged flowers is always in good taste. When someone you love passes away, it becomes especially important for you to show your true feelings once and for all. 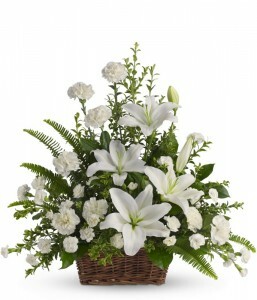 To send funeral flowers is incredibly vital to maintaining relationships through trying emotional times. In short, people need to know that they are surrounded by others who understand their hardships, and the deceased deserve the respect that flowers can give to them. Flowers and plants are often used to show a remembrance for a deceased loved one. Sending or bringing some beautifully arranged flowers is a terrific way to let someone know you care. And although the dead cannot exactly tell that you brought them anything, it is still quite the honourable way to say your last goodbyes and pay respect to the remaining friends and family members. There will probably be enough tears and sorrow to go around at a funeral, so why not bring or deliver something more upbeat? For the sake of helping everyone heal more quickly from their loss, giving flowers is highly recommended. Not only could a beautiful floral arrangement, bouquet or plant help someone feel less alone in their plight, but it can also foster a more positive feel to the overall funeral atmosphere. In ancient times, flowers were placed around the caskets of the deceased to ward off the smells that emanated from the dead body’s decaying process. Today, we have better techniques for dealing with a corpse, and thus we do not use flowers for the same reason. Still, bringing or delivering something that creates a certain type of aromatherapy is a great way to naturally elevate moods at an otherwise depressing time. When you offer flowers to the deceased you are symbolically saying that the person will live on forever – even if only in your heart. Flowers are reminiscent of a person’s inevitable return to their maker. While flowers work to tell how much we loved the deceased person and because they symbolize eternal life, they can be planted later in homage to your loved one’s life-cut-short. 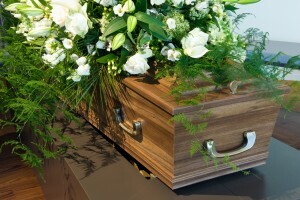 Regardless of how much someone means to you, there are extenuating circumstances wherein you may not be able to attend the actual funeral ceremony. In order to show the remaining loved ones of the deceased that you truly care despite your inability to be there, you could always send a big, beautiful funeral flower arrangement. Funeral florists in most cities offer comprehensive floral delivery services, so sending something meaningful is easy no matter where the funeral is taking place. 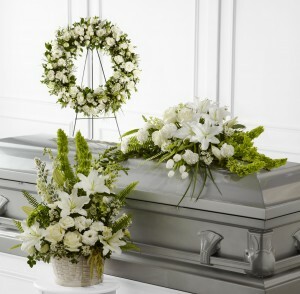 Just make sure that you deal with a reputable florist, lest the funeral party receive something offensive or incorrect. When it comes to saying goodbye you will want it to be just right, especially when you can’t be there to say it yourself.